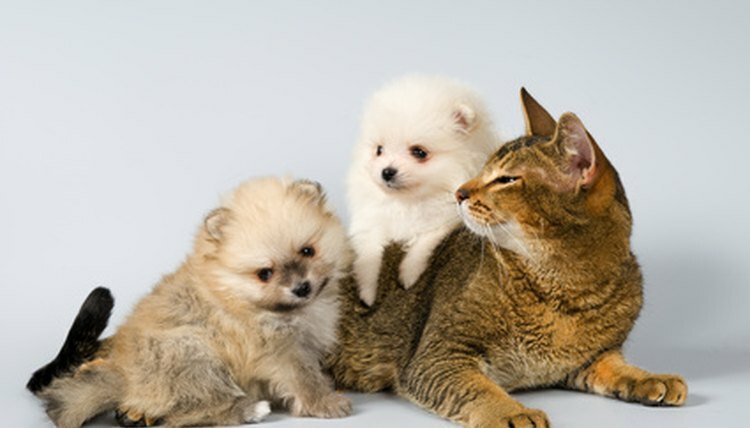 Many dog and cat owners face the decision of how to treat their pet for fleas. Fleas are potentially more than a mere annoyance; they can also cause several health issues, such as anemia in younger dogs and cats, tapeworms and dermatitis. Several chemicals can kill fleas on contact with a pet’s skin, but they are also potentially dangerous for the animal. A natural way to kill fleas is with a flea comb and mineral oil, which are used in combination to remove and exterminate fleas without harming the pet. Set a large piece of white paper on the floor. Use an area of the home where the animal feels comfortable, is warm and is away from distractions. Combine two cups cold water, two tbsp. liquid dish soap and half a cup of mineral oil in a large bowl. Dip the teeth of a flea comb into the mineral oil mixture. Place the animal on the paper and begin to comb though its fur with the flea comb, paying attention to the tail and the area around the face and neck, as these are places where fleas most frequent. Continue to dip the flea comb into the solution and work it through the animal’s fur. The mixture kills several of the fleas, and the comb causes fleas to fall onto the white paper. Remove your pet from the white paper and examine it for any fleas that are still alive. Place any moving fleas into the mineral oil mixture to drown them. Repeat combings two or three times a day until the fleas are completely removed.